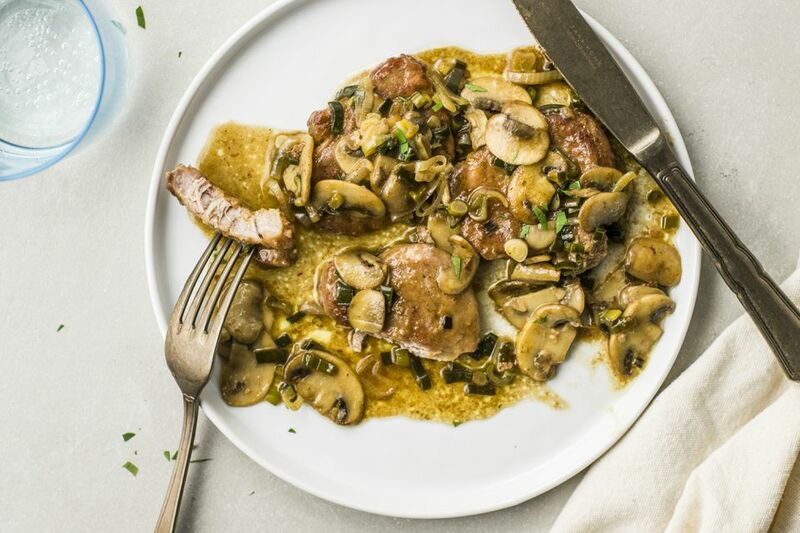 Marsala wine gives this simple pork tenderloin dish a fabulous flavor. Serve with hot cooked rice, buttered pasta, or with baked or roasted potatoes for a great family meal. Slice the pork crosswise, about 3/4- to 1-inch in thickness. With the heel of your hand or a meat tenderizer, gently pound to make the medallions about 1/2-inch thick. In a large skillet, melt 1 tablespoon of butter with 1 tablespoon of olive oil. Sauté the mushrooms until golden. Add the green onions and continue cooking, stirring, for 1 minute. Remove vegetables to a plate and set aside. Combine the flour with the salt and pepper. Dredge the pork medallions in the flour mixture. Add 1 tablespoon of butter and 1 tablespoon of oil to the skillet. Cook the pork medallions over medium heat for about 3 to 4 minutes on each side, or until nicely browned. Add the wine and broth to the skillet along with the mushroom mixture. Simmer, uncovered, for 2 minutes. Cover and reduce heat to low; cook for about 10 minutes longer. Serve with rice, potatoes, or pasta. If you can't get enough pork tenderloin, you'll love these sweet and savory dishes.